Enjoy the snow resort without skiing or snowboarding.Accommodation package for enjoying the winter mountains -- "Yuki(snow)Girl Stay"
The 3 days/2 nights "Yuki(snow)Girl Stay" accommodation package subverts the prejudice of "winter mountains = for people to go skiing and snowboarding", and allows people who do not do winter sports to still feel comfortable enjoying their unique stay in the winter mountains. In order for guests to enjoy a flourishing stay even without winter sports, besides various activities and scenic spots for sightseeing, there is also a "Snow Girls' Goods" rental including outerwear and boots, and the provision of "Snow Dinner" and "Snow Breakfast" which are themed around all kinds of snow scenery. 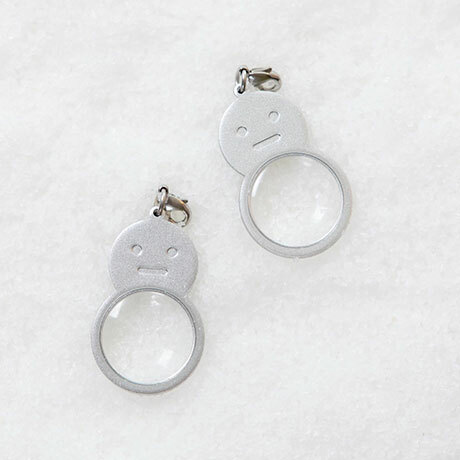 We have prepared "Snow Girls' Goods" for guests who have reserved for the Yuki(snow)Girl Stay to enjoy the experience, even the temperature in the winter mountains at Tomamu goes down to about -15⁰C. 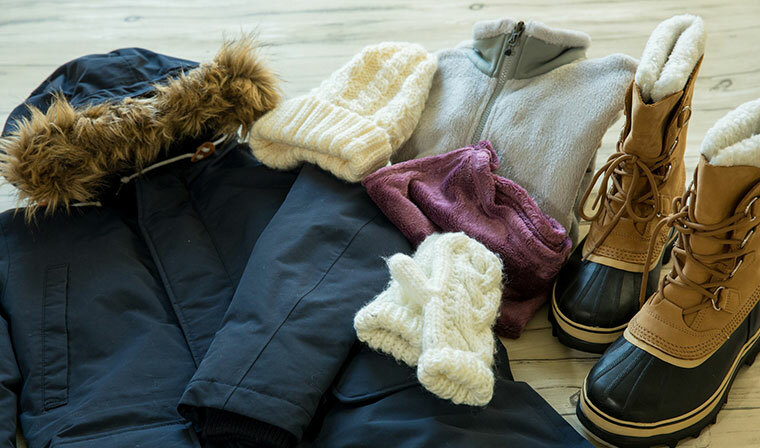 Stylish outerwear and boots that withstand extreme cold, and even little things like gloves and neck warmers are available for guests to use, so they would not need to bring ski wear and could pack light to just come and enjoy a carefree stay. Also, items like "Snow Glasses" that allow you to see snow crystals are also prepared to flourish your winter mountain walks. Snow Breakfast is the breakfast at Tomamu that mimics a snowy scenery after accumulation. Before having fun in the winter mountains, we offer you a meal with a warming "Snow Nabe" hot pot. 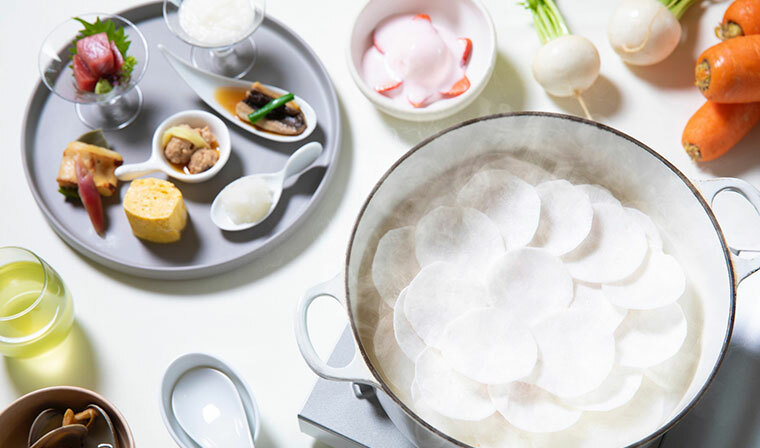 Snow Nabe is made with various roots like carrots and lily bulbs, and covered with turnips and daikon on top to mimic the accumulated snow covering Tomamu's land. Besides, since the restaurant serving Snow Breakfast is on the top floor of RISONARE Tomamu, you may enjoy the meal while gazing at the magnificent snowing scene. RISONARE Tomamu North Wing 32nd Floor "Platinum"
*The content may vary according to the stocking conditions. Snow Dinner is a full course meal made in an effort to mimic the gradual accumulation of snow as the season shifts from fall to winter. 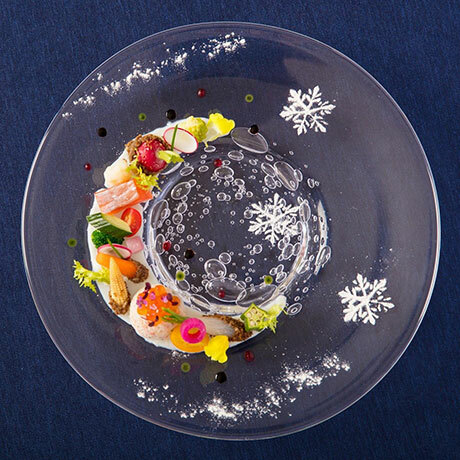 In order for you to also have fun with its presentation, there are dishes like an appetizer that presents the flourishing nature of Tomamu in its first snow, and a meat dish with scattered snowballs on the accumulated snow. 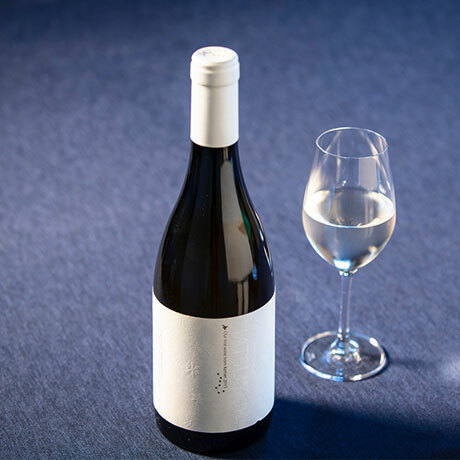 Starting from this winter, we recommend matching your meal with the white wine "Hatsu-Yuki (first snow)". The wine is made without additives to bring out the original potential of grapes. It is characterized by its apparent sourness and excellent balance, which make it an ideal match with all cuisines. 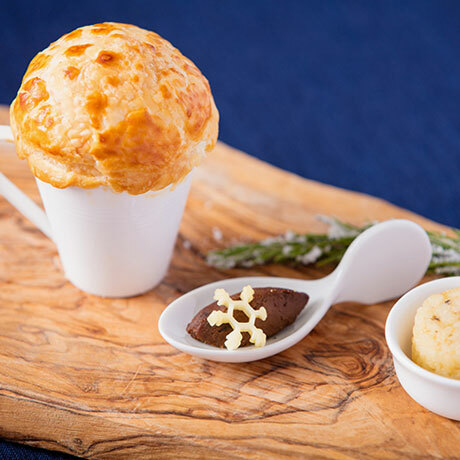 A dish that conveys the season shift from fall to winter, through a puff pastry-wrapped soup. An appetizer mimicking the accumulation of first snow on the land with cauliflower puree and 10 kinds of colorful vegetables. Using pasta sprinkled with cheese to represent the continuously snowing scene. 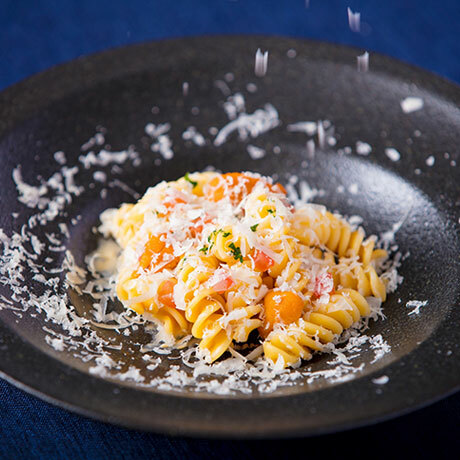 The cheese is sprinkled right before serving to preserve its taste, together with the prominent sweetness of sea urchin and tomato. 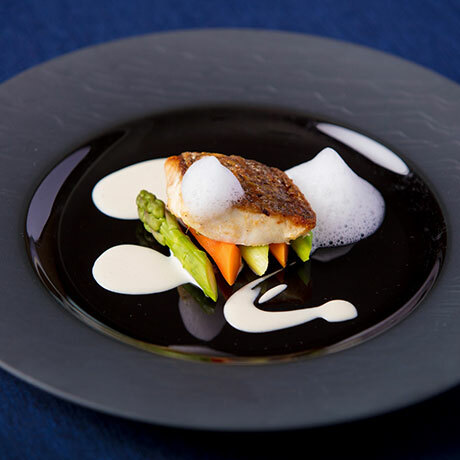 White meat fish matched with ginger and white wine sauce, decorated with foam made with kombu broth, to represent widespread snow on the land. 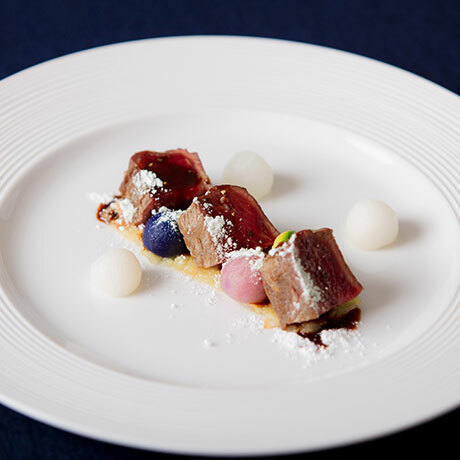 A main dish with bite-size beef accompanied by 5 kinds of vegetables like potato and Nagaimo in snowball shape. Also, horseradish powder is sprinkled on the beef to bring out its taste, as well as creating the image of snowing. 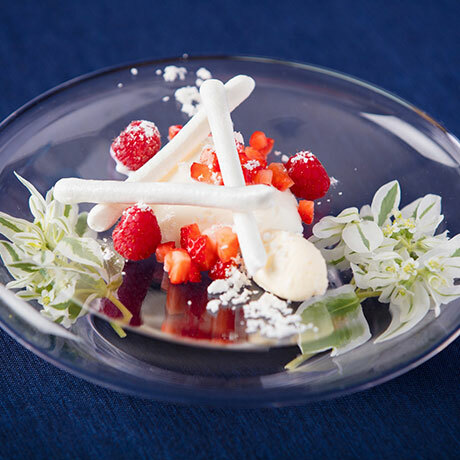 A dessert presenting a season shift from winter to spring, by adding raspberry and strawberry to the rosemary blancmange. 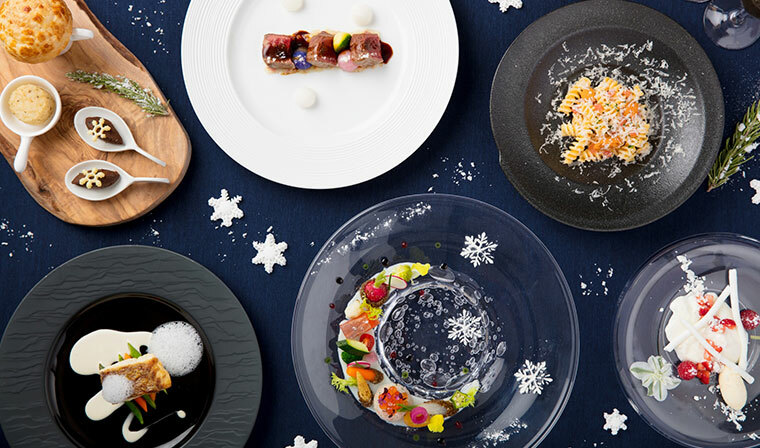 Private Dining "Mina / Kanto"
Staying in a room filled with goods and items themed around snow and ice. 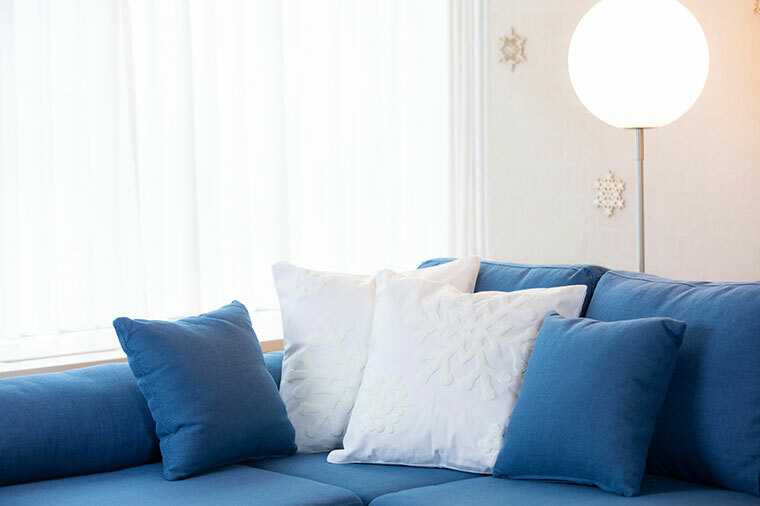 The guest room for Yuki(snow)Girl Stay is decorated with cushion and glasses designed with snow crystal patterns. 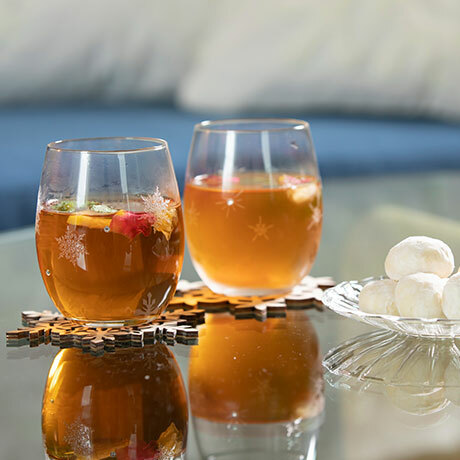 For the guests to enjoy their stay in the guest room, besides preparing alcoholic drinks and sweets, there is also a "Icy Welcome Drink" provided at check-in. This is an exclusive welcome drink for Yuki(snow）Girl Stay guests. It is made by pouring hot black tea over ice cubes made with edible flowers and fruits, to let the aroma pervade as the ice melts. Here the guests are reminded of the snow resort by the snow and ice atmosphere even staying inside the warm guest room. Snow Girls' SPA Treatment is a back treatment using cosmetics that contain white carbonate powder which looks like snow. 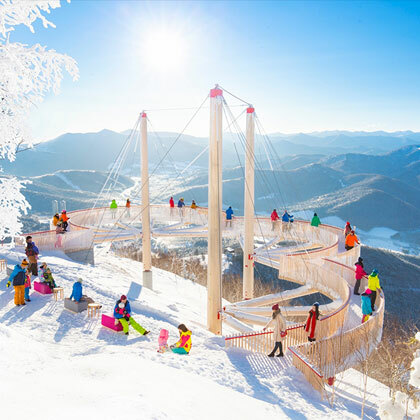 Let your body tension be released and completely relaxed during your stay at this snow resort. 60 min per person＊Excluding time for changing and consultation. RISONARE Tomamu North Wing 2nd Floor "SPA Etuk"
＊Service contents are subject to change. ＊There is a special menu for guests with allergy. It's a special seasonal promotion package, and accept new booking on limited date. For further inquiries, please kindly send an email to below address. In the resort, we are proposing various winter scenic spots and activities for guests to enjoy even without skiing or snowboarding. Add activities to this package to enrich your stay even further. A town that appears every year only on winter's nights. 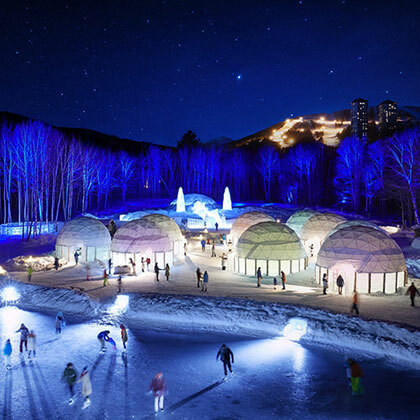 A place to enjoy activities and food that make good use of the cold. An overlook spot located at 1088m high in Mt. Tomamu, where scenic frost trees can be seen.